If I hear, "Honey, I'm working on Saturday again..."
This week, I think I caught the "burn-out bug". I'm tired, but I still press on. I unload those dishes, I make those dinners, I sigh quietly when my husband says he's working another weekend, we do the activities and the school work. I caught a glimpse of my November calendar and it's just a bit scary. I press on, because I know December is coming and we have a whole month off of school. (Happy Dance) I will be guarding our time like crazy! We need some time away from the endless, frantic pace. I am so ready. 1 month...you can make it....1 month....press on....1 month...you can do it! Whew! It's been a crazy, busy week! I usually try to space our busy-ness out, but this week it just all exploded. Yes, we had a lot of great experiences. No, we are not all happy go-lucky today. It's been a rough day for several of us. Yes, I am reminded again why we try to be home at least two days a week. Yes, I'm looking forward to a long break around Christmas. No, I'm not exactly looking forward to a chess tournament at the library tomorrow. No, I cannot live this busy ALL the time! It wears on the heart, spirit and soul. Glad to say, that's a wrap! For more Weekly Wrap-ups, visit Weird, Unsocialized Homeschoolers. 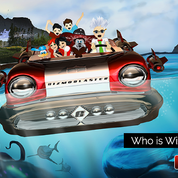 Justin Cummins & Chris DelAguila are two fathers and the founders of Wizzy Gizmo, who saw the need to provide Bible-based entertainment options for their children. From that need, came Wizzy Gizmo! In a media-saturated society, it's hard to follow the mandate of Deuteronomy 6. 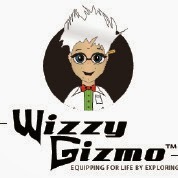 Wizzy Gizmo is a kids' Bible series geared to ages 4-12 that believes in "equipping children for life with God's Word." These resources are meant to supplement Bible study in family devotion times, home schools, churches and other areas of Christian education. For this review I received the Wizzy GizmoFast Track New Testament Series ($14.99): "A twenty-seven card set, each containing a New Testament book summary, key chapters, passages, doctrines and people." 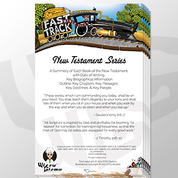 As a mom, I love the durability, eye-catching colors and details to the Fast Track New Testament Series cards. Tera loved the memory verse for each book of the New Testament. Daniel really enjoyed the concise theme for each book. Easy to understand as a kids' Bible study tool, but great for adults, too. While the full-color books and audio dramas are great for younger children (as well as older), these cards engage the middle school and up student wanting to do more in-depth Bible study. As a home school, we are reading through the New Testament one chapter a day. When we start a new book, the kids will read the Fast Track card to get an overview. These cards are a great addition to family devotion time. Our church reads through a book of the Bible at a time. Fast Track New Testament Series helps to key the kids in on important doctrines, passages and ideas in our Bible study. How about memorizing the key verse from each book of the New Testament? These cards would also be a great Christian education resource for Sunday School teacher and children's workers. These would be a great go-to resource at the spur of the moment. An hour long dramatization of the days of creation with fun music. Click on the link above for samples! A full-color, 58 page book that covers chapter 2 of Genesis. Teaching kids they are special and unique, because they are created in God's image. A free weekly devotional and worksheet with a new memory verse! Be sure to check out more reviews from other Homeschool Mosaics writers! With fall comes lots of activity! The boys are taking swim lessons on Mondays. Michael has shown so much improvement. He can float all by himself now and is putting his face in the water! This morning, we had friends over for art. We have really been lacking in the art department lately. In the afternoon, we met with a couple of friends for a writer's group. It's so fun to brainstorm with these kids and to see their creative writing. Today, we wrote weather poetry. Earthquake creeping up as a rumbling stomp. A crushing blow from beneath the surface. Tears away from the destruction like a furious dragon. splitting from the middle of the earth. Slinks away like rats from sinking ships. I love our routine. And boy, am I tired at the end of a week like this. But....being surrounded by all this creativity is rejuvenating! More fun and rejuvenation awaits us tomorrow! We are 69 days into our school year and things are just pluggin' along nicely. Most days, you can find him building things with Keva blocks, Legos and any other building supplies we have. He's reading, doing a little spelling (fun stuff), math and handwriting. We're reading aloud Mr. Popper's Penguin, playing games and having tons of fun! Tera is loving 8th grade! She is studying the American Revolution and really diving deep into this subject she has loved since 1st grade. Algebra 1 is going very well for her, as well. But...chess school is what really inspires her right now. Their chess coach has been giving them lessons, books and videos to study. Some days (after school) it's an eat, sleep, play chess/think about chess/learn about chess kinda thing. I'm okay with that! Daniel is finding his groove this school year. He does his work (most days) without complaint or a lot of redirection. I've really seen a growth in maturity this year. I combined his science and history curriculum and that has been a good fit for him. Sometimes he just surprises me with what he produces. He is also suffering from Obsessive Chess Disorder. Eating, sleeping, breathing. It's a whole new set of lingo and vocabulary for this reluctant chess mom. JP has been working 12 days straight, most of those 10-12 hour days. It's been rough. Yesterday, he actually took off a couple of hours early, because his back was hurting. Then, we were gone all afternoon to chess. He got some much needed alone time, but said he would have rather spent time with us. He's so sweet! I got new glasses yesterday. Since I strictly wear contacts except for my nighttime reading before bed, I've been wearing the same pair for about 7 years. They are very ugly, asymmetrical and not very nice. JP really disliked them. So, I figured it was time to go ahead and get another pair. Fortunately, our eye care center had a deal for contact wearers like me. I got a solo in the upcoming Messiah performance. Very excited about that! I also went with a friend last Friday night to find my dress for the performance. I love it! It's one of those dresses that make you feel so good about yourself, yet just a little self-conscious at the same time (Can I really wear things like this?). I need to buy more clothes like that! Tonight, I'm going to a game night at a friend's church and next week is full of friends, learning, classes, fun stuff and CHESS. We can never forget about chess. JP worked SEVEN days this week and almost 75 hours. It's been a crazy week! I'm trying to get back into normal meal preparation. Tera and I did a bunch of freezer cooking this weekend. The kids have been sleeping in later and grabbing whatever they don't really have to prepare for breakfast. So, we focused on breakfast foods and at least 1-2 lunches. We made 5 different recipes that will cover about 10 meals. Tera made muffins and baked oatmeal. I made breakfast burritos, bean and cheese burritos and muffin tin omelets. I accidentally made a crockpot of beans earlier in the week, when I had other things on the menu. So, I turned those into refried beans for the burritos. (Basically, I filled tortillas with beans, onions and cheese. Wrapped each one in plastic wrap and put them in a freezer bag.) I ended up with several extra quart size bags of refried beans to freeze for quesadillas and burritos. Last night, I made one of JP's all-time favorite recipes, Hamburger Quickie from Mrs. Eby's Man Holdin' recipes. She reminded me we've been married for 20 years, so it must have worked! Tonight, we've got Easy Coconut Milk Curry Chicken with rice and flatbread on the menu. I guess fall has truly arrived as you can tell with all this cooking and baking we're doing. I've been slowly working through the book, The 30-Day Praise Challenge. (Twice as long as I should be.) Anyway, the above devotion really hit home with me. I just never thought about being addicted to BUSY. For moms, this is really hard. We have so much to do and so many responsibilities. Yet, how many things do I let crowd out "the most important thing". Guilty as charged. I get to this time of year and I'm struggling with balancing celebration with grief. So many mixed emotions. I try to stay busy to keep from thinking too much. Then sickness hits the kids and I'm forced to be home for a few days. Away from the busy. When I take stock of the day's events, I'm left wondering what I actually accomplished. I'm reminded that just like I can be addicted to chocolate, watching television, surfing the web; I can be addicted to the frantic pace of producing and accomplishment. Sometimes, we just need to take a long, slow breath and another and another. Breathing in the sweet goodness of the Lord and breathing out all the worries, stresses and need "to do." Such a hard lesson, but such a needed one! We started celebrating Tera last weekend with our girls' game night. Tera shares the same birthday as two of the other girls, so we surprised the three with a party. Two of the other families hosted, decorated and made gifts for the girls. We had a fun time celebrating these three awesome 14 year old young ladies! Daddy stopped on the way home from work to bring his favorite girl flowers!